The XXVI Latvian Song and XVI Dance Celebration will take place in Riga from 30 June to 8 July 2018 in the spirit of the Latvian Centenary. The Celebration week is the culmination of what the organisers—the Latvian National Center for Culture—and the amateur ensembles have been preparing for since the XXV Latvian Song and XV Dance Celebration. 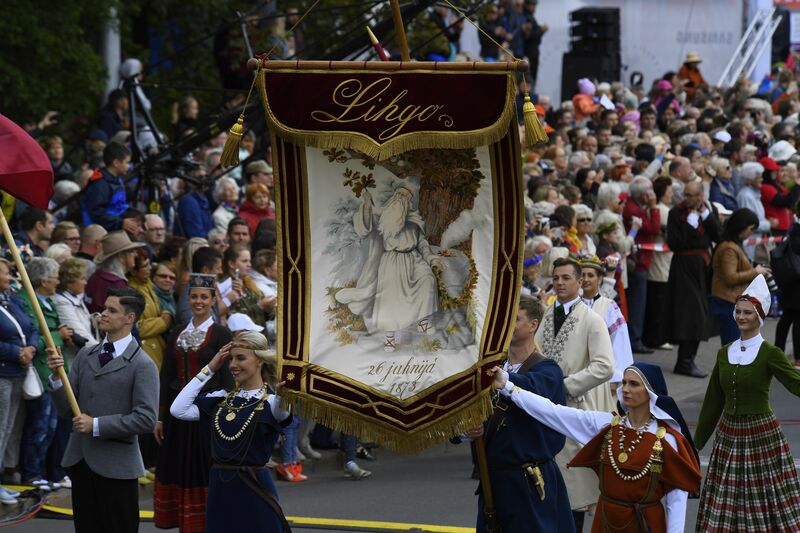 During Celebration week, Riga will host 43 000 participants from 118 Latvian municipalities, and from many other countries where Latvians continue to uphold and develop the traditions of the Song and Dance Celebration. For seven days they will take part in more than 54 events—choirs, dance ensembles, brass bands, kokle players, folk musicians, vocal ensembles, folklore ensembles, and others will perform in various events, the Latvian folk costume exhibition, the Latvian applied art exhibition, and amateur theatre performances. 500 000 celebration-goers (roughly ¼ of the Latvian population—1,96 million) will be able to attend (ticketed and free) events. The XXVI Latvian Song and XVI Dance Celebration will open on 1 July 2018 with the traditional sacred music concert at the Riga Cathedral, followed by the Celebration Procession throughout the streets of Riga. Participants showing off their rich folk costumes will walk a route that takes several hours through the streets of Riga. The procession will conclude with a special opening event dedicated to the participants. The most anticipated events are the great dance performance Māra's Country and the closing concert Following the Starry Path. Approximately 17 000 dancers in the Daugava Stadium will tell the rich history of Latvia through music, energy, movement, rhythm, color, and the patterns created by the steps of their folk dances. 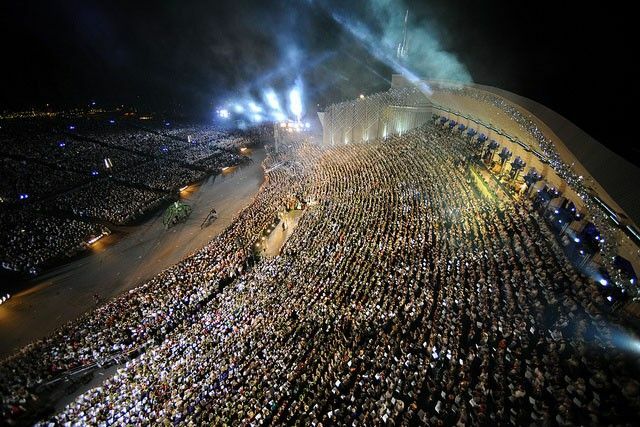 Celebration week culminates in the closing concert Following the Starry Path, in which the voices of 12 000 singers on the Mežaparks Open-air Stage will enchant their listeners in three hour concert of the most outstanding Latvian professional choral music. As the prepared concert ends, audience members will be invited to add their voices, and the Nighttime Sing-along will continue until sunrise. As one of the largest and most significant events of the Latvian Centenary, the XXVI Latvian Song and XVI Dance Celebration reflects the messages and values of the Centenary Celebrations. At the centre is the individual, celebration participants in the broadest sense—singers' grandmothers, composers, volunteers, seamstresses, and guests. Each of us is involved in creating and upholding the traditions of the Song and Dance Celebrations, together with our country—Latvia. The values of the XXVI Latvian Song and XVI Dance Celebration are dignity, community, and presence. The XXVI Latvian Song and XVI Dance Celebration is organised by the Latvian National Centre for Culture, an auxiliary of the Latvian Ministry of Culture and supported by major donors Swedbank, Elektrum, and Latvian Mobile Telephone. The Song and Dance Celebration is the greatest cultural masterpiece of the Latvian people, and has withstood the test of time. The Celebration has become an event of national and international importance, bringing together people of different generations and nationalities, and uniting Latvians throughout the world. From the first Celebration in 1873 where 1000 singers participated, the celebrations have evolved into a powerful movement—around 40 000 participants from 3421 amateur ensembles are preparing to participate in the XXVI Song and XVI Dance Celebration. In order for 12 000 singers and 17 000 dancers, and thousands of musicians, masters of folk and applied arts, as well as folklore and amateur theatre ensembles can participate in the Celebration, effort is systematically invested on a daily basis for five years—rehearsals, continuous revisions to the repertoire, recitals, contests, exhibitions, seminars, and concerts. And then, every five years, all of these artists and musicians from Latvia’s towns and rural territories flow into Riga, creating a powerful grassroots movement. Latvia's Song and Dance Celebration tradition has contributed significantly to the national consciousness, and to maintaining the idea of an independent Latvian nation during difficult periods of history. This has been recognised at the international level and in 2003 the Song and Dance Celebration was included in UNESCO's list of Masterpieces of the Oral and Intangible Heritage of Humanity.